Enjoy guided mobile transportation to Houston's finest resale stores. If you like shopping for bargains we know where to go.The treasure hunt runs Fridays and Saturdays and stops at several selected thrift and consignment stores, an international shopping mall, and a stop for lunch. Tours start promptly at 9:15 am and concludes at 3:00 pm. Enjoy five hours of great resale shopping. A carefully designed itinerary. An appropriate pace of travel so wear comfortable shoes for walking. You can expect no hidden charges. Guided mobile transportation in clean air conditioned vans and buses. Resale stores accept all major credit cards. Passengers will stop for a thirty minute lunch break at the beautiful Galleria shopping mall food court. Houston's finest international shopping mall that hosts more than 24 million visitors annually. On this shopping tour you will visit seven resale stores and you will have approximately twenty to twenty five minutes of shopping time at each store. 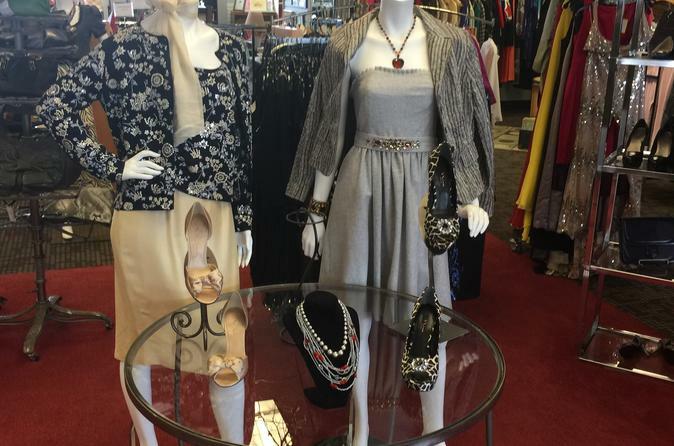 These resale stores offer name brand, clean and reasonably priced clothes, furniture and household goods. In addition, most stores have a structured system of discounting which lower prices even further. This treasure hunt trail runs through two of Houston's historic neighborhoods. The Montrose neighborhood is intimate and defiantly electric. It is one of the city's first grand neighborhoods ( Howard Hughes childhood home is here ). The Heights neighborhood dates back to the late 1800's with it's picturesque Victorian style homes. Both neighborhoods are filled with thrift and consignment stores, antique havens and cafes. This shopping tour is family friendly and fun for all ages. Come join the fun and excitement of resale shopping at it's best !